As time went on and I started doing YouTube videos more I started consciously using eyelash curlers everyday. I didn't notice a difference, but used them anyway, everyday before applying mascara. "Oh my Gosh!" I would think, "My eyes are so open now!" It wasn't until a month ago whilst I was in Mexico with Ingrid for my birthday that I learned the truth. She was helping me film a mascara review video, and was sitting quite close to my eyes as I curled my lashes (very close. Like practically in my eyeball) when she nonchalantly said, "Oh! Your lashes are so curly!" Huh? You can have curly lashes? How come no one has ever complimented me on my curly lashes? Then we switched positions and I filmed her while she filmed her mascara review video (we were being twins that day for #MakeupMayhem) and I watched in awe as I saw an eyelash curler actually DO something for the first time in my life. "Look what it did to your lashes!" I yelled happily at her. She proceeded to look at me like I was slightly askew and was probably thinking, "well duh. They are eyelash curlers. Aren't you supposed to be a beauty goo-roo?" And so, I learned a lesson that day, ladies and gentlemen. I have curly eyelashes. Like the hairs on my head, the ones on my eye are naturally curly (I didn't know that was a thing) and therefore curling them does nothing. The end. P.S. The point of this story was to point out that just because someone else says you should be doing something or using something doesn't mean you should. Do you have super clear skin but all of your friends are using acne-fighting cleansers? Don't use them! They can strip your skin! Do you have straight hair but love the idea of using a flat iron? Don't! (Actually, no really... don't. Talk about unnecessary heat damage. It's amazing how many people do this! In college I swear every straight-haired girl was flat iron happy.) And this rule of thumb can work for other areas in life too... you don't have to do something just because everyone else is. Don't be a sheep, be a lion. Although, I like sheep. And lambs. Baaaahh. You're so lucky you have curly lashes! I have straight hair, and sometimes I use a flat iron to get things more sleek. But I don't flat iron every day. yes!! I could never figure out why fake lashes were so hard to apply - but that's exactly the issue! I never curl my eye lashes, and never had a reason to. Mine curl up naturaly and the mascara just makes it more prominate. If I do use one, I just get a un natural looking crese in my eye lashes that looks discgusting! So jealous! I have stick straight lashes that can't handle most mascara formulas...even many waterproof ones. You are one lucky girl! This was such a cute post! 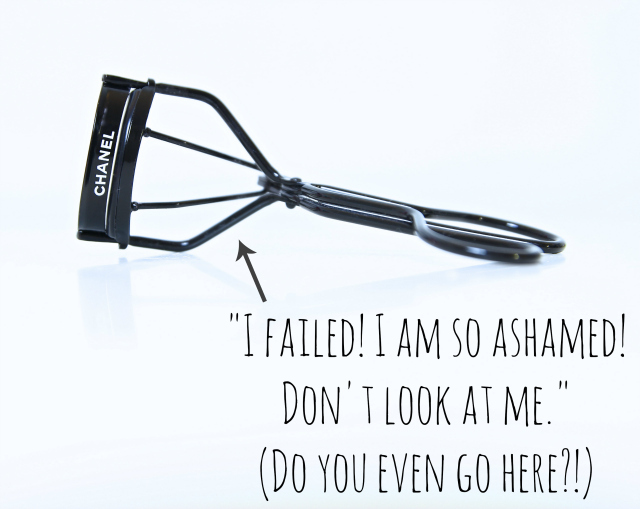 And don't shame that poor Chanel eyelash curler... if he needs a home, feel free to send him my way, because my eyelashes grow strait DOWN! Haha! I can't curl my lashes just like you said. It never makes a difference... Maybe mine are all ready curly too! I didn't know you could have curly eyelashes! I love your blog,you are so funny! Yeah, I've never bothered getting an eyelash curler, because my lashes just naturally curve upward a lot anyway. Never saw the point! This makes so much sense! I've tried three different eyelash curlers and none of them seemed to work. And I've always wondered why mascara ends up on my eyelids, even when I really try to avoid it. I love reading your blog- it always lightens my mood! haha this post was hilarious!! But my lashes are the exact same, I never really saw a difference in using an eye lash curler but I would use one everyday just because I 'thought' I was supposed to, but when the insert pad (not sure how to describe it) wore down I just didn't repurchase. And in all honesty I think my lashes are doing better without that unnecessary pressure everyday! obsessed with this blog, and you! you are so funny and insightful. any tips on how to make your lashes stronger, by any chance? I have the same thing! But when I curl my (already curly) lashes, I feel like they look stumpy because of where the "crimp" goes. Basically, it just bend my lashes in half, so that the lash roots go straight forward, and the ends curl up, which makes them look short and weird, haha. I haven't used my lonely lash curler in so long, because I just don't need it! But I love using lengthening mascara, which gives me baby doll lashes! I had the SAME epiphany when a make up artist told me the same thing! Now I have a eyelash curler with no use, haha. Hmm I didnt know curly lashes DO exist because I realised everytime I curl my lashes it made mine look extremely straight and its weird, so I stopped using an eyelash curler! My lashes are also pretty curly! I've never found it necessary to curl them. Lucky to have one less step in my routine. You mentioned you have curly hair... now that's something I'm jealous of!! I love your writing style, Elle! You are so sweet. My lashes grow straight down! Not to be racist but are most Asian girls like that? When I curl my lashes, instead of curling up, they bend up 90 degrees! It's so weird and so I never use any lash products... Can anyone tell me what I did wrong? I've always felt the same way about curling my eyelashes. I never really notice a difference. I think I will check to see if I have curly lashes :) Someone did tell me I had good eyelashes and that they went up...I guess that means they are naturally curled up? I agree with the "no problem why fix it" comment up there, too much stuff is bad in the end. I have very short, spare and straight lashes, oh and not to mention very sensitive. Most mascaras or eyeliners irritate my eyes, and make my lashes fall out..with one exception: Dr Hauschka mascara actually makes them grow!!! I feel like I would end up lashless if I curled those poor guys.. I don't think curling my lashes has much of an effect- until AFTER I apply some mascara, not the best.. but I wonder I'm just not doing it properly..
You're so lucky you're one of those people who have naturally curled lashes :( Mine just grow stick straight and it's so hard to find a good mascara that holds a curl with my lashes! I get my eye lashes permed, and the curl last for three months. i used an eye lash curler for a little bit but it was damaging my eye lashes so i stopped for awhile and about two years ago i found eye lash perming. Elle, well whats so wierd is that my 2 eyeballs have different eyelashes. one eye has long lashes and other much shorter. Thanks for the little lesson ;) I think to often we do whatever we read or hear and don't think about why. YES!! I have never curled my lashes because I never saw a difference. In fact, I found when I would curl them they would get in the way of my glasses and flick against them all day - super annoying haha And yes, I will confess I was one of those girls in high school who straightened their already straight hair. In my (very slight) defense, the ends of my hair do tend to curl in or out a bit which I never liked (and now I do). I have always just curled my lashes out of habit, I never thought that my lashes were already curly! All this time I thought I just wasn't seeing the results (even though I swear something was happening lol). Ya learn something new everyday huh? Thanks for this Elle! Aha, loved this, I'm in the exact same boat! My lashes are the same way, natural curly! I've never seen the appeal of eyelash curlers but I guess it's just because I don't need to use one! Well I've never noticed this. Haha! But I've always thought that the eyelash curler is supposed to help your mascara!! Haha. I loved this post. I could actually hear you talking to me. Keep it up! I'm so glad you're blogging. PS. Elle (or anyone else that might know) how do you annotate your photos? In photoshop? I've been wanting to put together cute images like this for my blog and don't know where to start. I use picmonkey.com :) It's free and so easy! I've been so convinced I was doing something wrong with them this whole time, haha. hahahahah, such a funny post elle! You never fail to make me smile! I've never used eyelash curlers either.I figure if my eyelashes curl up and touch the skin above my eyeball with just a couple coats of mascara(leaving a smudged mess) I don't need a curler! Elle!!!!!!!! curling your eyelashes is soooooo baad for them!!! it breaks your eyelashes!!! and it stops them from growing! i love you and your videos sooo much, and i am so glad i found and actually started reading your blog! (its amazing) i really hope you see this and reply to it!!!! I used to curl my eyelashes religiously...until my curler broke. That's when I realized that my lashes curled naturally and I was just wasting my time! Anyways, really funny post Elle! Love your blog! Recent Posts : Sale Survival Guide - Aritzia, Colours of the Rainbow TAG and more! A haul will be coming up soon! First time in your blog, and i'm in love! My eyelashes are naturally curly too and I was always like you, like um this does nothing for me so i stopped until one day I heated my eyelash curler with a blowdryer and then curled, I'll tell you even you will notice a big difference. And if you're wondering my lashes don't seem to fall out or get harmed so it's pretty cool if you have the extra time to do it. I've tried that! It still doesn't work for me, LOL! Like you never thought I needed to "curl" my eyelashes, for years I've never done. I never thought I might have curly eyelashes too ? but my hair is not curly, just wavy. Got you.However, in my case, I love love my eyelash curler and it does wonder to my eyes. I got naturally straight hair and so my eyelashes are straight too, so eyelash curler is my best friend! Come learn how to be the best at everything! I don't curl my lashes because I've never felt it does anything for me either, now I know why. I just love reading your posts! You always have me giggling! My lashes are fairly curled as well and yet I still use a lash curler. I curl mine in 3 places - very close to the roots, the mid-section and somewhere closer to the tips. This way I get a super intense curl but whenever you apply mascara the curl falls a bit. So this 3 part curling helps my already curled lashes look way longer and opens up my eyes really well! hahaha great post! I think that mine are a cross... so curling helps!